The dessert I made for Conor and the wife was PutneyFarm’s chocolate-packed brownies, and to make it even more special I made some crème anglaise to turn it into something that looked like a plated dessert. Crème Anglaise is the French name for vanilla sauce, which should of course be made from scratch using a good-quality vanilla bean. Good vanilla beans are fragrant and sticky. 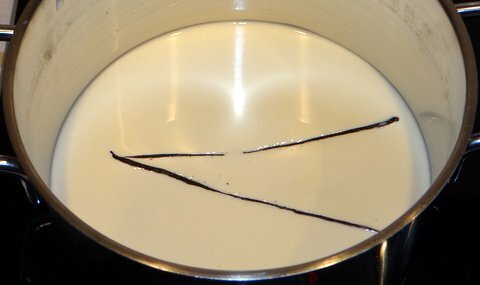 Stay away from the dried out sorry excuses for vanilla beans that are often sold at supermarkets, although those are still better than using synthetic vanilla. Synthetic vanilla contains only the most prominent compound called vanillin, and tastes boring compared to natural vanilla. If you can’t get good vanilla beans, pure vanilla extract (which is made from vanilla beans) is a good substitute. The photo also shows the perfect wine pairing for most chocolate desserts: sweet sherry from Pedro Ximenez grapes. It also goes well with the vanilla sauce. Crème anglaise can be served with chocolate cake or brownies, but also with fruits or other desserts. Cut open the vanilla bean lengthwise. Put the cream in a saucepan with the vanilla bean and heat to about 85C/185F. The cream should not boil! Allow to steep for about an hour. Scrape the seeds out of the vanilla bean and add to the cream. Whisk until the vanilla seeds are distributed evenly. Add sugar and egg yolks. Heat, stirring, until the mixture has reached a temperature of 85C/185F (I like to use an instant-read thermometer) and the cream thickens and coats the back of a spoon. 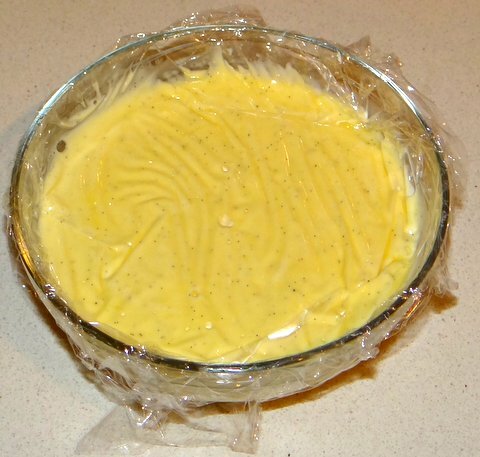 Cover the crème anglaise with plastic wrap, pressing the plastic down onto the cream, to prevent a skin from forming. Store in the refrigerator if not using straight away. 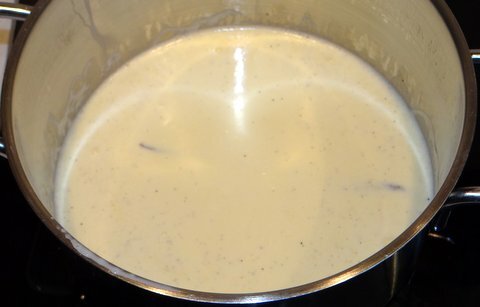 The crème anglaise can be served cold, at room temperature, or warm (again do not let it boil). Top quality it was too. Thanks Conor. This was the final post about your visit by the way. We’ll have to have you guys over here to keep the thing going. There are also plenty of Northern European bloggers we can rope in to have some Boundary Free Blogging without too much travel expense. We both took risks and I think we all ended up better off as a result. We’re planning on that. We already have a lot of plans for this year, so not sure if it will be this year or the next. Also depends on whether we are just coming to Dublin for a weekend or staying a bit longer to see more of Ireland. I believe that one doesn’t enjoy what life has to offer without taking some calculated risks here and there. You are definitely right that this one paid off. Great ingredients make great food. Love it! Goodness me, if this is how you treat visitors you’ll have more knocking at your door! This looks wonderful. I generally don’t have to twist people’s legs to come over for dinner, that’s true 😉 Thanks! Hi, Stefan. Great post. We love creme anglaise. It is so versatile. 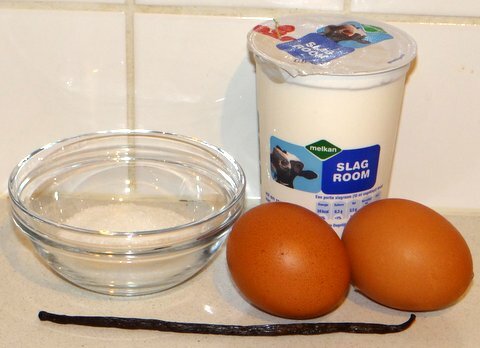 We also make our own vanilla that we use in the creme anglaise, among other things, using 2 split and scraped vanilla pods to 750 ml vodka and allow to sit for 60 days. There is a reason for all the jokes about Granny nipping the vanilla. It is incredibly good. Also, for grins, I make creme anglaise sous vide. Guaranteed to come out perfectly every time, even with distractions. 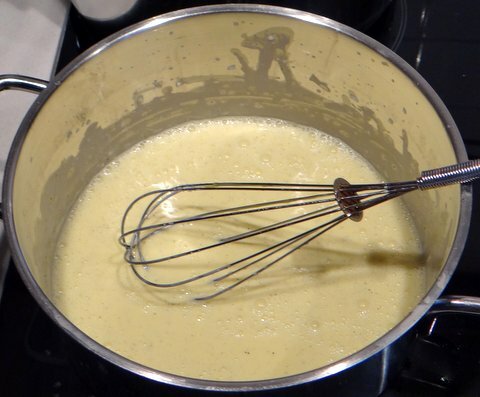 I also use creme anglaise as the base for many of my ice creams. I like the texture and flavor profile it adds to ice cream. When I do the dessert chile relleno my intention is to use creme anglaise as a garnish drizzle at the end. Simple syrup soaked ancho chiles stuffed with an orange chocolate mousse drizzled with creme anglaise and chocolate syrup and topped with whipped cream and orange zest. 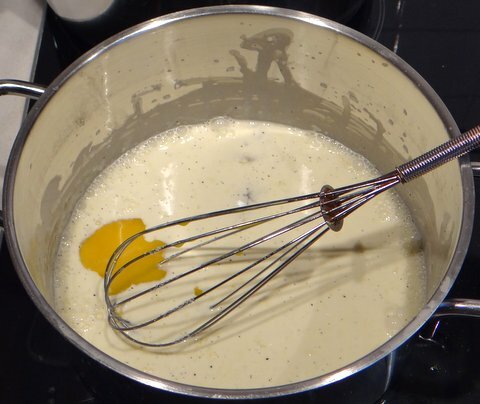 I have thought about making crème anglaise sous-vide, but it didn’t seem easier or less work than making it the old-fashioned way so I never actually did. Part of it is that the waterbath takes some time to heat up to 185 degrees, and also because I read in several places that the pouch has to be ‘massaged’ to cook evenly. 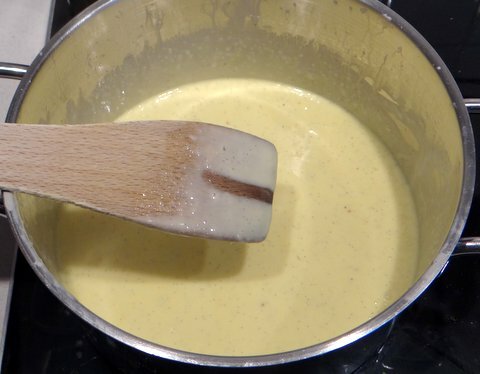 I use crème anglaise as a base for ice creams too, usually using half milk and half heavy cream. The dessert chile sounds amazing! I appreciate the photos and the step by step! It’s a lovely result! Carolyn and I both looked at this and said- “we have to try this”. We are always looking for ways to improve a dish, and the creme anglaise looks amazing…and we know it tastes good..
Thx again for the mention. Thanks — I would love to hear how it turns out! Crème anglaise would be the perfect exclamation point, Stefan, to the fine meal your prepared for Conor and his wife. Thanks for sharing your recipe. Grazie! Vedo che hai trovato il mio blog in inglese 🙂 Fammi sapere se vedessi qualche ricetta che dovrei pubblicare anche in italiano. Whilst I cannot help but admire the creation (as usual exemplary) my eye was immediately drawn to the pot of cream in the second shot. It highlights the wonderful clashes of language that can occur – over here slag room would go by a completely different meaning…actually i just looked it up and it means whipping cream. The double entendres just keep coming. It should indeed be silky — I know people that pass it through a sieve to get there. That is a great idea – a very fine mesh strainer – that is a technical culinary tool. A good investment. Crème Anglaise – still in awe. NICE.